He is one of the great enigmas of rock’n’roll: the visionary guitar hero who created some of the greatest heavy rock music of all time, but went on to play Renaissance folk music, then returned to rock when everyone least expected it; the hyper-sensitive, virtuoso perfectionist with a ruthless Machiavellian streak; the moody ‘Man In Black’ with a penchant for practical jokes. What is certain about Ritchie Blackmore is that he’s one hell of a guitar player. In a recording career of more than 50 years, he has earned a reputation as one of the most extravagantly gifted and influential musicians in rock history. Moreover, Blackmore’s brilliance has been acknowledged even by those who have found him difficult – or indeed impossible – to work with. Deep Purple singer Ian Gillan called his former colleague in that band “a giant among guitar players”. Ronnie James Dio, who worked with Blackmore in Rainbow in the 70s, referred to him as simply “a genius”. It was with Deep Purple that Blackmore became legendary, but his legacy extends far beyond Purple. In the early 60s he served his apprenticeship as a session musician and member of The Outlaws. With Rainbow, the band he formed after quitting Purple in 1975, he made nine studio albums, including such classics as Rising and Down To Earth. Since 1997 he’s worked with American singer Candice Night – now his wife – in the folk-rock group Blackmore’s Night. This phase of his career has drawn ridicule from some, who find the sight of a rock icon playing a lute while dressed in faux-medieval garb farcical. Purple’s drummer Ian Paice even joked about Blackmore’s demeanour during his last days with the band in 1993, suggesting that Ritchie was suffering from “pre-minstrel tension”. But, if anything – and perhaps even more since Rainbow surprised everyone by re-emerging with a little-known new singer in 2016 – Blackmore’s Night proves a truth about Ritchie Blackmore that has been evident since he first became a star: this is a man who plays by nobody’s rules but his own. Less than a year after he quit Deep Purple, Blackmore delivered a masterpiece with this, Rainbow’s second album. Rising had a power and grandiose quality perfectly illustrated by its cover art. 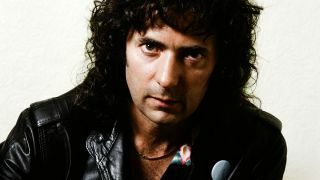 Blackmore had retained only Ronnie James Dio in a new line-up featuring heavy-hitting drummer Cozy Powell. Blackmore always played smart, and never more so than with his brilliant reinvention of Rainbow in the late 70s. Deciding that Dio’s demons-and-wizards shtick was passé, Blackmore replaced him with Graham Bonnet, whose quiff and Hawaiian shirts didn’t sit well with Rainbow’s denim-and-leather demographic but he was ideally suited to the radio-friendly rock of Down To Earth. Originally conceived as a solo project while Blackmore was still with Deep Purple, this album instead became the birth of a new band. Impressed by Dio when the singer’s band, Elf, supported Purple in 1974, Blackmore made the album using every member of Elf bar guitarist Steve Edwards. In the 70s, the double live album was a defining statement for such giants of rock as Kiss, Lynyrd Skynyrd and Thin Lizzy. Blackmore cut two monolithic live doubles with Purple, and Rainbow’s On Stage he matched them for bravura and excess. The partnership between Blackmore and Dio was never better than on Rising. And although they gave it everything they had on Long Live Rock ’N’ Roll, it would be the last album they made together. The Lord Sugar of his day, Blackmore fired a lot of people from Rainbow. An exception was Graham Bonnet, who quit when making the follow-up to Down To Earth. But Blackmore had the last laugh. With new singer Joe Lynn Turner, Rainbow had their biggest hit album and single with Difficult To Cure and I Surrender, both reaching No.3 in the UK. If Blackmore had wanted to make easy money, he’d have stuck with Purple, or called Ronnie James Dio. Instead he followed his heart by forming a new group with his then-girlfriend Candice Night, and playing the music he loved most. The days when he used to smash up a Fender Strat on stage are long gone, but at no point in the last 17 years has Blackmore ever lost touch with his rock roots. Across the eight original studio albums he’s made with Blackmore’s Night are new interpretations of old Rainbow songs, and covers of Jethro Tull’s Rainbow Blues and Uriah Heep’s Lady In Black. Although he was just 22 when Deep Purple formed, Blackmore already had an impressive CV. He’d worked as a backing musician for Gene Vincent and Screaming Lord Sutch, a session player on singles by Tom Jones and Freddie Starr, and was a member of The Outlaws with Chas Hodges, later of Chas & Dave. In 1995, two years after he left Deep Purple for the final time, Blackmore revived his second great band. It turned out to be Rainbow’s last stand until 2015 – and a miserable one.